What can I say about my trip to Peru? Life-changing? Awe-inspiring? Challenging? More like all of the above, and much more. Characterized with many highs and lows, we experienced, illnesses, success, hard work, culture, humility, and an overall life changing experience. Josh, Vincent and I really had ourselves a time while in Peru and I know I am for sure itching to go back. 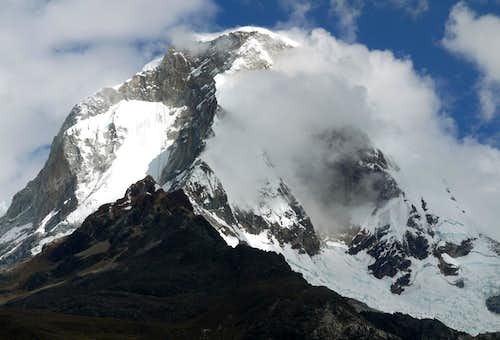 Vincent and I were successful on Tocllaraju, and Urus and Josh was successful on Urus and Alpamayo. Vincent also was successful on Ishinca and Vallunaraju prior to Josh and I arriving. It was January this year when I responded to a request for climbing partners for a trip to Peru here on SP. All I said is that I was seriously planning to go to Peru in July and it all took off from there. In February, I invited Josh, knowing how badly he also wanted to go and laid out a little of what the cost would be for him. He quickly agreed to go and by March we had a decent plan in place about how we would get there. In the meantime, I applied for an AAC grant to help fund the trip and amazingly, I was awarded one, which I am very grateful for! I also was in contact with Vincent via E-mails, who was living in the San Francisco area and luckily for Josh and I, spoke fluent Spanish. We agreed to meet at the bus station in Huaraz the afternoon of June 30th when we planned to arrive. So in April, a sudden end to the long project I was on at work prompted a spur-of-the-moment 3 week trip to Chile but that's a different story. May and June brought me less work, some climbing at home in WA, a couple weeks of work in Wyoming once again, and some altitude training in Montana and Colorado, though we didn't do much due to bad weather. Josh and I left the Denver International Airport on June 29th and were on our way to Peru! We had one short layover in Atlanta where I proceeded to waste some of our money and exchange dollars to Peruvian Soles and got a terrible exchange rate I didn't know was bad at the time. Oh well, next time I will exchange money IN Peru. Once we arrived in Lima around 11pm local time, we were forced to sleep in the airport since our bus to Huaraz didn't leave until the following morning. Luckily the Lima airport is a safe place and we felt comfortable there. We were warned to avoid the taxi ride to Plaza Norte (our bus station) at night. So when the sun came up, we saw a very cloudy sky (which apparently is common in Lima) and hailed a green taxi and were off on the streets of Lima. Talk about scary! Let's just say the typical American driver will crumple up with fear on the streets of Lima and probably crash in a matter of seconds. I thought Mexico City was bad, but here they took the words "controlled chaos" to a whole new level! Once at Plaza Norte, we waited for the bus and all I could do was look out to the vast amount of ramshackle homes and buildings up every surrounding hill. This was nothing like Chile at all I remember telling myself (which is almost a first world country). It was more like Mexico. I also thought it was odd that it's cloudy and drizzling nearly every day in Lima (just like Seattle!) but the city and entire surrounding region sits in an incredibly dry desert with immense sand dunes and nothing growing from the ground. This was especially noticeable on the bus ride north from Lima along the coast where the road was essentially cut into huge sand dunes and went through a barren wasteland, despite being on the Pacific Ocean, and having a climate like Seattle. If I were to pick one thing that I thought was the most bizarre about Peru, it would be that. I wasn't able to wrap my mind around it. Once we started heading east, and up the long, steep road into the mountains, the clouds disappeared, and views started to open up. We were in the front of the bus on the upper level so we could see everything! At first the surrounding mountains reminded me of Colorado (and the mountains around Santiago) sans the adobe brick sheds the locals called home. I was amazed at how the people lived here and I have great respect for them. True self-sufficient people who build their own homes, grow their own food and raise their own animals. Once the endless switchbacks ended, we crested over the Cordillera Negra and saw our first views of the Huayhuash, although at the time I didn't know what mountains they were. By this point we were driving at 13,000 feet. 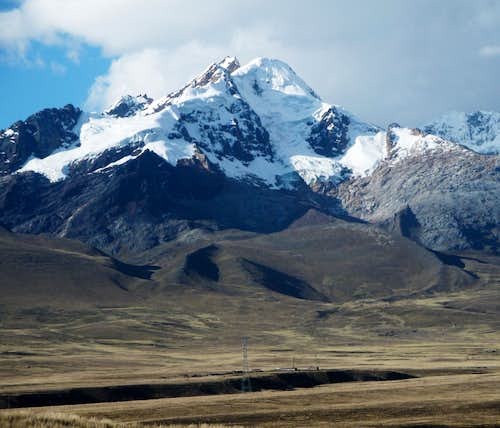 The remainder of the ride to Huaraz followed the valley north between the Negra and the Cordillera Blanca, which begin to come into view 50 kilometers from Huaraz. Once in Huaraz, I saw a vastly different town than Lima. This town looked much wealthier and had a bustling small town feel. Everyone seemed to be going somewhere and though the buildings reminded me of Tlachichuca, they were much nicer and cleaner than anything in Lima. Most roads were paved and a scenic river even ran right through town. Like clockwork, we exited the bus and Vincent was there waiting for us. Josh and I were clueless as to where we were going or what to do but thankfully, he already had a room lined up for us at the Caroline Lodging hostel. This turned out to be a fantastic place to stay as it was right along the river and away from the main center of town, therefore quieter. Many of the people we met there were climbers and trekkers from around the world and were fun to visit with. As soon as the lighting was good, I went up to the top and looked around and saw a beautiful town surrounded by incredible mountains. Vincent, Josh and I agreed the next morning we would do an acclimatization hike and the classic hike of the area was the trail to Lake 69, topping out around 15,500 feet. Teo, the owner of the hostel we were staying was able to set up transportation for us to the trailhead which was a couple hours bus ride away. So at 5am, we were up and ready and got on a bus that picked up many others around town before heading north towards Yungay. 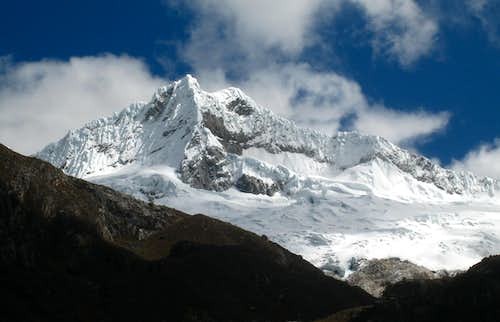 Once there, we saw it was a town of similar size and feel to Huaraz and we learned that the same earthquake that destroyed Huaraz in 1970, released a massive landslide of snow, ice and rock off Huascaran and buried the entire town and filling the valley with debris. Everyone in the town except a couple people perished that day. I was easily able to visualize where the slide was based on some topography around town and I was shocked. The slide must have been 100 feet thick in places and I was told it came down the mountain at over 200 miles per hour reaching the town in seconds! From Yungay, the bus began heading up a steep gravel road lined with homemade adobe homes. We saw children walking down the road the whole way up on their way to school. Many of these kids walk 3-4 miles each way to school every day!! We reached the entrance gate for the national park, showed the officer our park passes (which cost us 65 Soles and were good for 21 days). Shortly past the gate we entered a very narrow valley (Quebrada Llanganuco) and I couldn't take my eyes off the multi-thousand foot, vertical granite walls lining both sides of the valley. This was absolutely spectacular. At a milky green lake along the road, whose name escapes me, the bus stopped and we were able to get out and look around. I saw Huascaran Norte towering 10,000 feet above as I cricked my neck to get a look at its awe inspiring north face, one of the biggest faces in the western hemisphere. 15 minutes later we were at the trailhead, which is the same as for Pisco and started on the trail. After a quick descent, we passed a nice meadow where the Burros were housed for climbers on their way to the Pisco Refuge. We continued along the trail with our light day packs up the valley as the views of Huascaran behind us got better and better. The trail gently climbed up three steeper sections, passing a small tarn in a hanging meadow midway up. After a few hours of hiking, we reached Laguna 69 and Josh had a new elevation record. What a beautiful lake...deep blue waters at the base of steep icy mountain faces. I met a couple other Americans along the way who were on major trips through much of South America. The hike back and return bus ride to Huaraz went smoothly. Josh and I were both tired but since Vincent had already done two peaks he was feeling pretty good. Regardless, a large dinner in Huaraz ensued! After a good nights rest, we spent the next day planning what we would do for the first part of the trip we agreed we would all attempt Pisco in order to better acclimate before attempting anything bigger. After arranging some logistical information, early the next morning we headed back to Quebrada Llanganuco and arranged a group of burros to carry our gear to the Pisco Refuge. I took the hike up slow but the trail was in perfect condition. I caught up with Josh just before the refuge who was out of water so I gave him the rest of mine. Once we got to the hut the views across the valley to Chopicalqui was one of the best I have ever seen! Even while we ate an awesome pasta lunch in the hut, looking out the window to such a huge mountain was just something else. Josh set up camp near the hut while Vincent and I planned just to sleep upstairs. These huts were amazing and had full cooking services, flushing toilets, heating, electricity and a full set of nice beds to sleep on. After a beautiful sunset, we went to bed and set alarms for 1am. Unfortunately though, Vincent wasn't feeling the best and after hiking the short section of trail to the top of the lateral moraine a couple hundred meters above the hut, Vincent just felt ill so Josh and I continued ourselves. We had to negotiate a near vertical down climb of rock dust to drop down the other side of the moraine...all in the dark! We probably ended up dropping over 100 feet and worked our way through the loose rocks of the moraine. It was very dark without a moon so progress was slow. I was also dealing with digestive issues in this stage of the trip so I wasn't going overly fast as well and Josh was struggling with the altitude. We were able to follow cairns though through the maze of loose rock and got to the other side of the moraine and ascended to the top of the opposite lateral moraine. From here, a large lake was sitting merely feet away but we never noticed it. We picked up the trail as it ascended now more stable rock along an exposed talus arete where two glaciers once existed next to one another. By 4am we reached the edge of the glacier at around 17,100 feet and sat down to rest. A second party of two reached the glacier a few minutes after us and were quickly starting up. They would eventually summit about 5 hours later. We just weren't feeling it at the time and I decided we should just nap a couple hours and watch the sunrise since I knew it would be great. Believe it or not, I got a little sleep despite being cold in all my clothes. When twilight began, Josh was too sleepy to get up so I grabbed his camera and spent the next hour photographing the scenery that surrounded us. It was incredible! Huandoy was right in our face at the head of the glacier and we were finally able to see the moraine we traversed in the dark as well as the beautiful lake we missed. 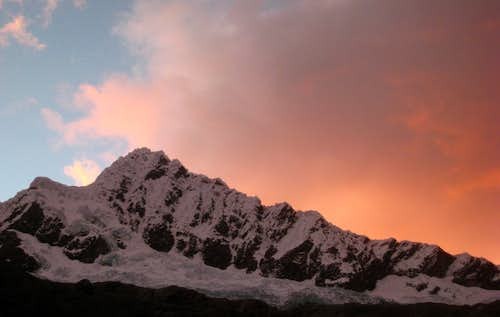 Huascaran and Chopicalqui glistened in the twilight and began to glow with the first rays of sun. This was likely the most beautiful sunrise I had ever seen. Once the sun began to get higher in the sky, we started our hike back to the hut. I wasn't looking forward to hiking back across the moraine but I knew at least I could see the mountains this time. we slowly made our way back taking many photos along the way. We returned to Vincent at the hut and had a nice lunch. He was feeling pretty bad with coughing so we wasted no time hiking back to base camp. 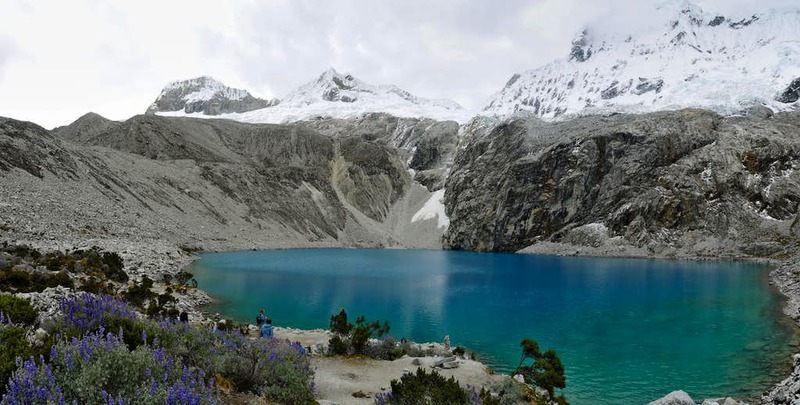 Our plans to go to Chopicalqui were abandoned and we caught one of the Lake 69 tour buses back to Huaraz to rest and come up with a different plan. Once back in town we had another fulfilling meal and made plans to head into the Ishinca Valley to attempt Tocllaraju. Vincent already had a failed attempt on this peak the week before Josh and I arrived so he was seeking revenge. His team was unable to safely navigate across a large bergschrund spanning all the way across the face. With recent beta of other parties going around it to the left, we were comfortable making a solid attempt, especially now that Vincent was feeling a bit better and Josh and I were better acclimated. Off we went in a nice bus on the steep, narrow gravel road towards the Ishinca Valley. The lower slopes of the Cordillera Blanca are filled with beautiful grasslands, farms and expansive views west of the Cordillera Negra (which are called that because they are devoid of glaciers making them have a darker look than the Blanca on the other side of the valley). The road ends at a large meadow before reaching the start of the narrow valley so this approach is much longer than the hike to the Pisco Refuge. We started up the nice trail following close behind the burrows. Not having to carry our heavy packs to base camps sure was nice. The trail wandered around beautiful farm country with great views of the high peaks. We entered the valley and continued up to the Ishinca Base camp, about 8 miles from the trailhead. This base camp has recently been outfitted with a new refuge and sits in a huge meadow below the end moraine of the glaciers dropping off Palcaraju. In fact, there are three large lakes that formed on the moraine above the meadow and they were threatening to breach the end moraine and flood the valley. To mitigate having the brand new refuge destroyed, they literally blasted the rock away at the terminus of the moaine to allow the lakes to slowly drain down the valley! Looking up to the moraine from base camp now you see a giant gash cutting the moraine. Josh set up camp next to the refuge among many other tents. The meadow was so large it could fit hundreds of tents easily however I was shocked to only see a handful of parties. Perhaps only 50 tents, mostly on the far side away from the hut. I later learned that the World Cup was probably responsible for a significant decrease in climbing activity in the Blanca this year. At first I didn't believe it...I mean climbers in the US would not stay home and watch the Superbowl over a climbing trip but sure enough, everyone's eyes were glued to their radios and TVs, even climbers who came to Peru from Europe! Since we came from the US, we could care less about the World Cup so I found it funny. Served us well I suppose. If you plan to climb in the Blanca, go 4 years from now! By this point, Josh had begun to get a fever and was coughing very badly. We paid for him to stay in the refuge with us that first night but he was unable to go beyond base camp and stayed in the tent while Vincent and I headed up to the Tocllaraju high camp. It only took us around 2.5 hours to gain 950 meters to the camp right at the edge of the glacier below a small rock tower. The trail started out mellow as it went to the left of the end moraine above the meadow, but steepened on the large slopes above. The final half-hour was mostly boulder hopping but we arrived just in time to take the large flat spot occupied by a party just coming off the summit. They informed us of the difficulties and we felt prepared. We relaxed at camp, had an excellent dinner made for us and I got to witness the best sunset I have ever seen. The views of Palcaraju and Tocllaraju above were great but Ranrapalca across the valley stole the show. That mountains is gorgeous and the way the light was on its south face with the lakes below was nothing short of divine! Words cannot describe what I saw but maybe the photos shown below can (a little). Right when the sun went down, we went to sleep with alarms set for 1am. There were about 4 other parties planning to head up as well so we wanted an early start in case we had to do any waiting. Amazingly, I slept well and the alarm came quickly. At 16,500 feet it was the highest I had ever slept. We were moving shortly before 2 in the morning and started up the easy glacier. Unfortunately, right when we started, clouds engulfed the moon and it started to lightly snow. This concerned us greatly but I had a feeling in a few hours, hopefully before sunrise it would clear up. The route began mostly flat as we hiked up the gentle snow, passing a couple crevasses that were easily avoided. There were two large guided groups just ahead of us. Vincent and I both agreed it was a good idea to start slow so we stayed behind the groups to conserve energy. After maybe an hour, it was still snowing lightly but the clouds kept the temperatures a little warmer. We reached the first difficulties of the route where two large bergschrunds cut through the glacier creating a large 100 foot step. The first one we simply crossed on a snowbridge, then climbed 100 feet of 60 degree neve snow which I did with just my mountaineering axe. By this point, the guided groups had us go ahead so I was leading the charge. Once above the first schrund, we followed foot prints 50 feet to the right and located the wooden ladder we were told was placed to allow passage of the second schrund. This is the spot Vincent got turned around a couple weeks earlier since there was no safe way around it and no ladder had been placed yet. This time though, it was fairly simple albeit scary as hell. We set up a boot-axe belay for one another and as we crossed it, the ladder would flex, as if it wanted to break! Luckily it was only about 8 feet long. The crevasse dropped at least 100 feet into the depths of the glacier. You know what they say though..."Don't look down!" Once across, the terrain eased for nearly another hour and during a rest break Vince and I took, the guided groups passed us. We all reached the crux ice step we were told about at the Ishinca Refuge. An 8 foot, slightly overhanging water ice step above a small cravasse presented the most technical climbing of the route. We waited as the first guide easily climbed it and set a belay for his client, a short woman who tried (and failed) for nearly a half-hour to climb the step. Finally her second guide pushed her up from the bottom until she reached the easier 60 degree snow above. During the time we were waiting though, the clouds parted and with the moon now set, it was a starlit sky, and nearly completely dark. Vince then led the ice step without needing any pro and belayed me up. I was tall enough to basically run up as I was able to get my tools up over the ice just standing at the base. When I met Vince, we were now on the narrow crest of the northwest ridge and the remainder of the route would follow the ridge to the summit. I led up the next pitch for about 45 meters and set a belay on an exposed spot of the ridge. As Vince followed up back to me, I gazed down the mountain to the small towns surrounding the base. It was completely dark and crystal clear. I was surely in a special place in a setting few people ever get the chance to experience. The sun rose just as we got to what I thought was the final steep pitch. We crossed a fairly large crevasse and I belayed Vince up a full 60 meters as he climbed the 60 degree snow nicely. We climbed right next to a couple other parties including one of the guided groups. Above this pitch we arrived at a large flat bench and got to finally see the remainder of the route to the summit. A 250 foot headwall with fairly steep snow was all that was left. By this point it was about 8am and I was feeling pretty exhausted but I wasn't going to make Vincent turn around a second time so I pushed on. We simul-climbed a couple rope lengths of 45 degree snow and then it began to steepen. 50, 55 then 60 degrees as Vince led up, set a picket and I began to climb up the steepening snow. As I passed by a small ice knob to my left, I re-entered the shade and the neve turned into ice and my calves felt a new level of pain I didn't know existed. Other than that I was fine but for a brief moment while I kicked in a platform upon reaching Vince, I believe I was screaming in pain. After 10 minutes or so to rest my calves, Vince led up the final 50 feet to the summit ridge where flat ground was found. I finished the last but slowly, making sure my picks and crampons had good bite in the snow, and rolled onto the flat summit ridge just as one of the guides set up his first rappel on the fixed pickets. Relieved, Vince and I made the final 5 minute walk to the highest point and congratulated one another. This was certainly the biggest climb I had ever done and given that it was 1,300 feet higher than my previous altitude record, I was tired! But now it stands at 19,800 feet and I am proud of myself for pushing through the pain...safely. The views from the summit were breathtaking. Palcaraju and Huantsan in particular caught my eye. I had heard how hard Huantsan is it it looked hellish! After 15 minutes on the summit, which is 15 minutes I will never forget, we made the short walk down and the guided groups were nice enough to let us use their ropes to speed up the descent for everyone. So a guide rappelled first, set up the next anchor and we all went down. The first double rope rappel utilized fixed pickets and the second was made by one of the guides. t made it much faster since two parties of three (guided groups) and us made the summit which adds up to 8 people. The other two parties turned back at the base of the final headwall for some reason. After safely descending the headwall (I was glad we didn't have to down-climb it as I was getting out of breath just rapping! ), we made another rappel down the steep pitch just below using my picket, then the guides made an anchor for the final rappel over the overhanging crevasse. This was the crevasse that had the ice step. We rappelled to skiers left of where we climbed making for a scary, free hanging rappel at the bottom and with thick gloves on, I was concerned about the rope sliding through my hands too fast. Slowly though I maneuvered myself over the lip and down. The last photo above shows one of the guides making this rappel. The final difficulty to navigate was crossing the ladder and down climbing the 100 feet of steep snow. It took me some time since I was getting very tired at this point but the abundance of steps already in place made it nicer. From there, it was an easy snow walk back to camp where warm water and food was waiting for us! After a 30 minute nap we packed up camp and hiked back down to base camp where we met Josh who was still feeling fairly sick but a little better than when we left. We all agreed to take a rest day, then go climb Urus the following day. A nice couple games of chess and an excellent dinner in the refuge was exactly what I needed after that big effort. The following morning we slept in and just relaxed all day. I played some more games with a french couple who arrived that morning, and took some photos. Amazingly, I met a couple from Boulder Colorado and chatted with them much of the day. Josh was slowly getting better and at 3am the morning after, we all woke up and started up the trail towards Urus. This trail started right next to the refuge and was easy to follow. We made great time up to the small moraine and scrambled up as high as we could on the slabs and talus. Josh and I switched into our plastic boots when we hit the glacier and we all roped up. The climb was a cakewalk compared to what Vince and I just did but still beautiful. We saw headlights all along Tocllaraju that morning since the moon set so early, it was pitch black until the sun came up. We reached the summit block at the end of the snow just as the sun rose and dropped all our gear. The final 200 feet was an easy scramble to the top. There were less clouds so we were able to see further than we were on Tocllaraju. 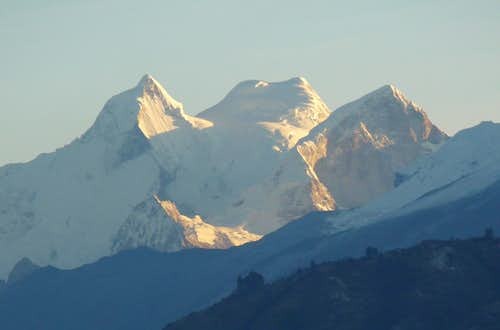 Huascaran dominated the view to the north and Ranrapalca to the south. Tocllaraju was stunning from Urus and Josh finally got to see our route close up. We sat on the summit for a good 45 minutes we we were the first ones up that day with the next group hours behind. The descent went very quickly as we didn't feel the need to rope up going down the snow. We ran down actually, passing a couple groups heading up. Upon reaching the end of the snow, we repacked and went back down to the hut. The massive guided group with 10 expedition tents that came to base camp the day before were on their way up as well. There was at least 20 people clearly acclimating based on their pace. We returned to the hut no later than 10am and decided we should arrange to hike out that same day, instead of waiting another night. By this point I was ready for a hearty meal and a shower since it was our 5th day in the Ishinca Valley. The overseer of the refuge was able to call a taxi for us with the satellite phone and we found a couple horses to haul our packs down for us. Three hours later we were back at the trailhead where the taxi was waiting! We returned to Huaraz and back to Caroline Lodging where Teo was happy to see us. We went for one of the best meals I ever had (LOTS of meat) and decided to rest the following day and go to Hatun Machay. I kept hearing fantastic things about this place and some rock climbing would be a nice break from the mountaineering. In Huaraz, we caught the daily bus to Hatun Machay which was a couple hours away deep in the heart of the Cordillera Negra. Actually the views of the Blanca and Huayhuash were incredible in the clear morning skies. We signed in at the hut and a five minute hike later we were at the famous towers of course grained sandstone. There are literally hundreds of sport routes in this massive area and further development potential seemed endless. Here are a few photos I have from our "rest day" at Hatun Machay. We got everything in order the following day and explored the town a little more. We met Mark, who is from Austria who was just arriving to Peru from Ecuador. We told him about our trip to Alpamayo and since we were looking for a 4th person (to go in teams of two), he agreed to join us. Unfortunately the morning we planned to leave, Vincent caught a bad stomach virus and didn't sleep at all. He had no choice but to rest in town and have the three of us go. Alpamayo was the main goal for Vince so I felt bad for him but we went and took our bus ride to Cashapampa where the trail for the Santa Cruz Trek begins. In a nutshell, we spent six days on this outing. Our fist day was hiking to Llama Corral and the second day we continued to base camp. The long hike was very gentle and scenic. Our third day we hiked up to moraine camp, then to high camp on the fourth day. Getting to the col between Quitaraju and Alpamayo involved a pitch of 65 degree snow but there were perfect steps the whole way. High camp was a couple hundred feel on the other side of the col.
On the fifth day, early in the morning, the three of us went for the summit. We reached the large schrund which was easily crossed and I led the first full pitch up the French Direct but as I belayed Josh and Mark up, I got a sudden illness and began to feel light-headed and nauseated. I was unable to belay them the final 40 feet to me as I almost lost consciousness. They climbed up to me, clipped into the picket I had placed and the two of them continued, with Mark leading the remainder of the climb. We had one other party of two with us that morning, a couple guys from England. They agreed to lower me off the pitch I led back to the schrund where I could then hike back to camp myself to rest. I was able to down-climb on belay to the bergschrund and returned to the tent and went right to sleep. I was very frustrated and couldn't figure out why I got sick. I woke up a few hours later and saw Josh and Mark about halfway up the route. I was feeling quite a bit better by this point so I shot some photos of them. Shortly after the sun rose though, clouds engulfed the mountain and I wasn't able to see them until they were back down near the base of the route, 8 hours later! 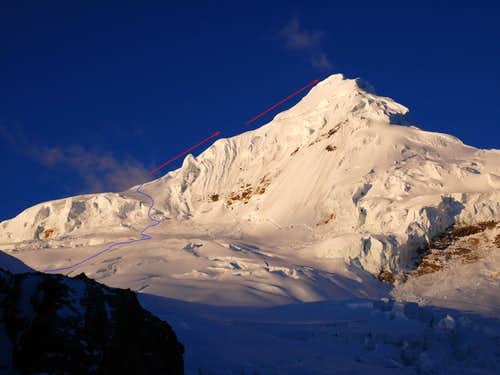 At 6pm, we began hiking back to the col and rappelled down the other side as it got dark. We made the descent down the glacier all the way to base camp in the dark with no moon. Shortly before midnight we made it and went to bed instantly. The following morning we hiked all the way out to catch a taxi/collectivio back to Huaraz, where we met Vincent. He had to leave the next morning so we had one final dinner together and the next morning he was off. Here's some of my photos from this part of the trip, in no particular order. Once Vincent left, neither Josh or I was up to climbing another peak. Josh was still recovering from his monumental effort on Alpamayo and I was still disappointed I wasn't able to continue. I had more than enough strength and was plenty acclimatized but just fell sick to what I believe was melting snow that I grabbed too close to camp. Therefore, I believe the snow was contaminated. But oh well, Vincent and I will have to go back sometime for it! Since Josh and I only had a few days left, we took a day to rest after returning from Alpamayo. We just hung out at the hostel and visited with other travellers. We figured we would just end the trip by doing the other classic lake hike in the area. Teo told us where to meet the daily bus and the next morning we walked across town to the gas station where the bus leaves but we must have missed it. We were able to meet another guy with a van who took us up for 30 Soles which wasn't too bad. We walked on a sheepherders trail from where he dropped us off to the boundary of the national park. Luckily we still had one more day on our park passes. The hike up to the lake was fairly short, especially given we were very acclimatized. Lots of other hikers were there but the scenery was great with Crurup towering above the lake. After an hour at the lake I thought about swimming but there were too many clouds blocking the sun to make it worth it.